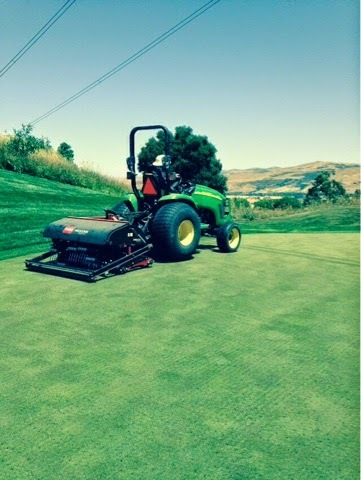 This week we are performing a deep aeration which utilizes tines that are 5/16" diameter by 10" long. 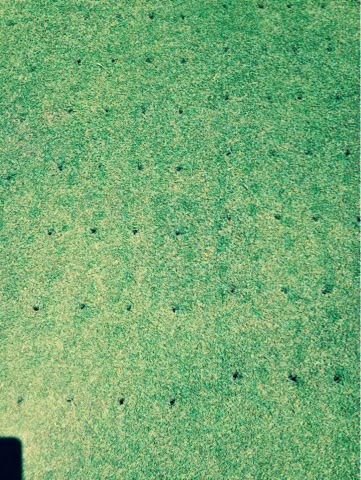 The eventual hole is 8" deep and they are spaced in a 4"x2" pattern. This aeration will allow for better flushing of accumulated sodium and will also assist in breaking up a small pan layer that we have. A pan layer is a layer that has formed just below typical aeration depth which is approximately 3-4" below the surface. The pan layer can accumulate sodium and bicarbonates and prevents a good flushing. You can use this cultivation experience as practice for the mental side of your game. While you will see holes, there is virtually no disturbance of ball roll as they are cut and rolled following.